Each of these words helped me with my relationship with God, which was the original reason I decided to do this. I’ve always been a believer, but there have been times when I’ve struggled in my relationship with Him. Specifically, I’ve struggled with the love He has for me. It’s not usual for someone with a background and childhood like mine to grow up to have struggles in their relationship with God. While I’ve made great strides there are still areas I want to work on, and the word of the year practice has helped me to do that. I’m a word lover, after all, and the practice of mindfully going back to one word throughout the year has kept me focused on what I want my life to be like. This isn’t goal setting. It’s not like I have a series of tasks I want to check off in an effort to move forward. Rather, this is a way to change my thinking. So when my mind goes back to old, destructive thoughts (e.g., “God doesn’t like me”) I can focus on my word and it reminds me of how I want to be (and want to think) instead. 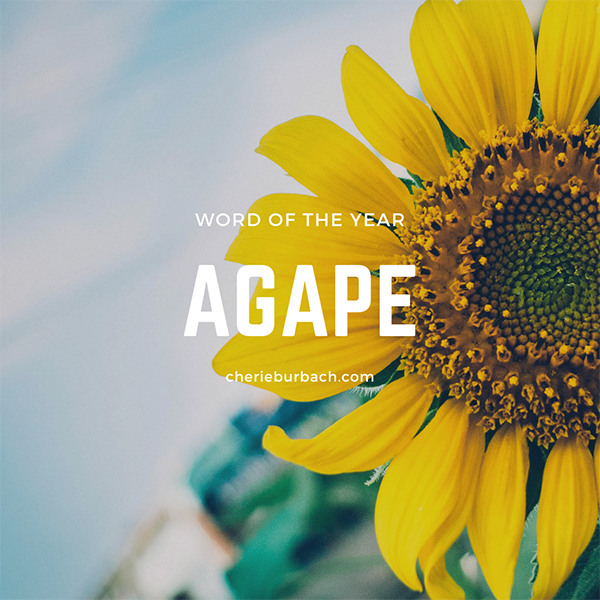 This year, I decided the word to focus on was agape. Agape love refers to the kind of love God has for us. It’s about relationship, affection, and all the things we think about with love, and adds a million more layers we couldn’t possibly understand. I want to know God in the way He wants me to know Him, and not in the way I’ve viewed him with my limitations. We talk about “putting God in a box” sometimes which means defining him in a way we can place neatly in our minds and hearts. The trouble is that we neglect what he has already told us about himself. And his way is always better, even in the way he loves us. For me, this means knowing fully and completely that I am loved by Him. It sounds so simple. But knowing and accepting Him in the way he most wants me to do is something I’ve struggled with because of my own shortcomings. I was given up for adoption and then raised by an abusive alcoholic, and this has shaped my view of God. Too often, I view God as not liking me, just like my adoptive father did. I view him as having an impossible set of rules that I will never be able to live in or meet. I view him sometimes as looking at me with disgust, as I often experienced as a child. I’m ready to change all this. For good. I’ve worked on my relationship with God since I first became a believer as a child. I will always work on it. There will always be room for improvement, just as I will always need to strive to be the person He most wants me to be. But I am glad in the space of this moment and the other side of heaven, there is a patient, loving, teacher, who understands me and loves me just as I am. I want to understand and embrace this to the fullest extend I can.